Officials from Washington, Tokyo and Seoul will sign a trilateral intelligence-sharing pact in an effort to strengthen their surveillance network on the nuclear-armed pariah state of North Korea, Seoul officials said. Although the United States already shares intelligence on North Korean activities separately with South Korea and Japan, the trilateral agreement marks a historic partnership for the three nations. Due to historic tensions connected to Japan's colonial rule of the Korean Peninsula from 1910 to 1945, the sharing of intelligence between Tokyo and Seoul marks a significant step forward in bilateral relations between the two Pacific powers. In April, President Obama’s Asia tour seemed to have succeeded in reducing regional tensions over historical and territorial issues hampering Washington’s efforts at trilateral cooperation. During his visit, the US leader gave Japanese Prime Minister Shinzo Abe assurances that the Senkaku/Diaoyu Islands, which have been a matter of controversy with China, are Japanese territory. Obama thus became the first US president to have “overtly stated that the Senkaku/Diaoyu Islands fall within the purview of the US-Japan security treaty,” the Diplomat reported. 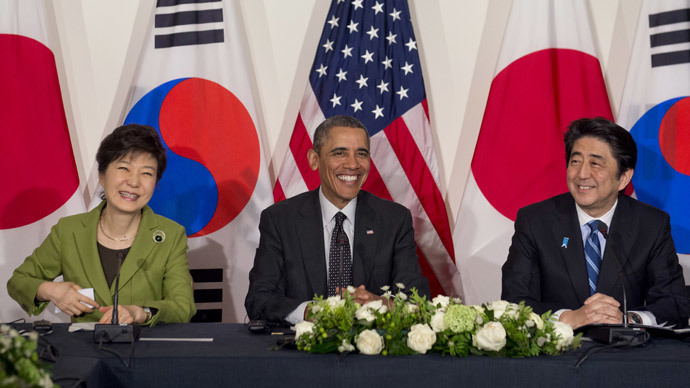 These statements soothed historic tensions and helped seal the deal between Seoul and Tokyo. According to the agreement, to be signed on Monday, South Korean and Japanese officials will share intelligence on Pyongyang's nuclear and missile programs, via Washington, South Korea’s Defense Ministry said in a statement, AP reported. On October 9, 2006, North Korea stunned the world when it carried out its first underground nuclear test, followed by a second test almost three years later. On February 12, 2013, the closed communist country announced it had conducted its third underground nuclear test in seven years, although Japanese and South Korean investigators had failed to detect any radiation. In light of these ongoing tests, Seoul believes North Korea has made progress in its efforts to develop and produce nuclear missiles that are capable of reaching US territory, or US military bases that are located in both South Korea and Japan. The two Koreas remain technically at war because the 1950-53 Korean War was concluded with an armistice as opposed to a formal peace treaty. In October, troops of the rival Koreas exchanged gunfire along their heavily fortified border several times, though no causalities were reported.